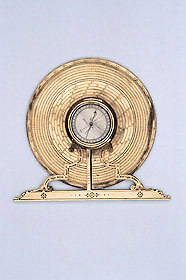 This beautifully and carefully made protractor was intended for specialist applications by a military engineer. The central scales give the successive positions of the tangential rule for drawing the sides of regular polygons with different numbers of sides between 3 and 16. Such polygons were the basis of the plans for contemporary fortifications. The outer degree scale is divided by diagonals so that it can be read to 2 minutes of arc. That idea that angles could be, or would need to be, drawn to this level of accuracy seems extravagant.